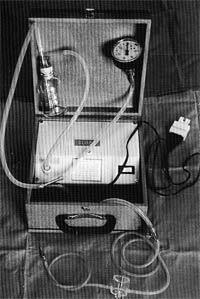 The prototype was assembled by S Catania in 1983 (Figures 3.59, 3.60) with the aim of eliminating most of the disadvantages of the traditional aspiration technique and, at the same time, of maintaining the advantages of the needle-only approach. Sampling from tissue other than the lesion may be reduced. In fact, during the progression of the needle from the skin surface to the lesion a small positive pressure (pneumatic mandrel) in the system prevents other material (such as subcutaneous fat) from entering the lumen. The intensity of aspiration may be varied according to the consistency of the lesion. Reversing the pump action to positive pressure allows the expulsion of all the aspirated material almost without any loss. The sampling is performed according to the same phases as conventional aspiration employing the syringe and the handle. The pressure in the system is 10 cm H2O to prevent material from entering the needle. As soon as the aspirating action of the pump is interrupted the residual negative pressure in the system drops to O. This avoids the disadvantage of the classic aspiration technique where the return of the piston may cause expulsion of the aspirated material and cancer cell seeding. With the conventional technique the expulsion of all the aspirated material is difficult and a certain amount of material is usually lost unless some manoeuvre is adopted to recover it. 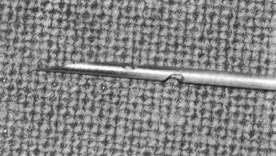 Some material remains in the needle cone where it is visible and a few drops may be recovered by beating the needle cone on to the slide. The automatic pump may exert a 1.5 atm positive pressure which is enough to expel all the material in the system. The positive pressure may be adjusted by a knob. Apart from expelling the aspirated material the air jet may be used to ensure a better spread on the glass. 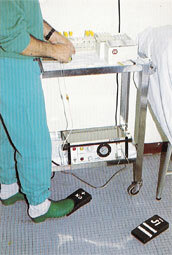 The pump is equipped with two pedals, one for remote control of aspiration, placed near the patient, and the other controlling the positive pressure, placed near the table for smear preparation.